The idea behind this next company I want to tell you about is to simply just be. 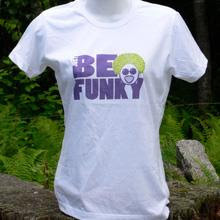 Just Be is a state of mind, way of life and a philosophy all in one and represents a line of apparel and accessories that are not meant to inspire you, but to simply just be you! Just Be attire allows you to express how you feel or how you want to feel. 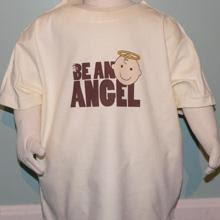 Just Be t-shirts were also included in the Oscars gift bag that were given to celebrities in February 2009. How cool is that? That’s not all either- they have also been featured in a documentary starring Kate Winslet and Daryl Hannah, the 2009 Sport Emmy Awards gift bags, and they participated in “Back to School Celebrities Gift Bags” and t-shirts were given to the kids of Angelina Jolie and Brad Pitt and Gwyneth Paltrow to name a few. It’s such a great concept that I am not surprised how popular the Just Be apparel is. So what exactly is so great about this line? For starters, each item has its own saying like Be Beautiful, Be Sweet, Be Green or Be Organic. Then it also has a picture usually inspired from vintage posters from the 1920s all the way to the 1980s with themes likes art deco or punk to name a couple. Their clothes can be worn by anyone at any age right from babies to grandmas.I received the Be Pink (Breast Cancer) in medium for review which allows me to show my support for breast cancer research. It’s a 100% Ring Spun Cotton which has an incredibly soft feel to it. It has hot pink cap sleeves made soft baby jersey knit which adds a nice contrast. I loved how it was fitted since that’s how I prefer to wear my shirts and the length was perfect. It was not too short to ride up and show my belly which is a concern of mine when buying shirts. I prefer them a bit longer to cover my weakest area! I wore this shirt with my black yoga pants (another staple in my wardrobe) and thought it made an awesome outfit. It gets better too- a portion of the proceeds from all Be Pink tees goes towards finding a cure for breast cancer so you can wear a cute shirt plus help in the fight against cancer. I always love a company that gives back to charity and does its part. The prices are amazing too! 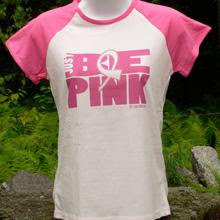 The Be Pink shirt I got is $18 which is well worth it. I actually am planning on buying more of them. Perhaps I’ll get the Be Kissable or Be Sweet. Hmmmm…it’s a hard choice since I would love to “Just Be” many things!